One of the reasons that kids act out and don't listen, is because they feel trapped. *Trapped because they don't feel like they have any freedom. *Trapped because they don't feel like they can make any of their own choices. *Trapped because they don't feel like they have any control over their lives. Think about it for a minute, put yourself in your children's shoes. Our kids get up in the morning and we tell them what they are going to eat, what they are going to wear, what they can and can not do, when they will sleep, etc... For the most part, we make all their decisions for them, or at least have a say in all of their decisions. As they start to feel constricted, the struggle for power begins and they act out and don't listen. If someone told me what to do all the time, I would feel trapped too. So here is a thought. Just say "yes". What does this mean? Pick a day in the next week or so and try to say "yes" to EVERY request your kids make. Yep, every request. Think of it this way. When they ask for something, will it hurt them, or put them in a harmful situation? If not, seriously consider saying "Yes". Maybe they want gum before breakfast, say "yes". Maybe they don't want to wear a shirt today, say "yes". Whatever it is, say "yes". Will gum for breakfast hurt them? No. Will running around without a shirt on, hurt them? No. When I evaluate why I answer the way I do, I usually realize that my answers have more to do with me, then they do the request, or my kids. Yikes, that is not how I want to be. SO, Let's do this together. Pick a "YES" day. You will find that giving them some freedom to choose, some power over their own lives, will improve their behavior and your relationship. You might also find a transformation happen within yourself. You might start realizing that you can say "yes" more than you thought, and start giving your kids a little more choice. This will lighten your load, it will alleviate power struggles and bring peace to your relationships. Why do YOU say "No"? Do you think you can do this? 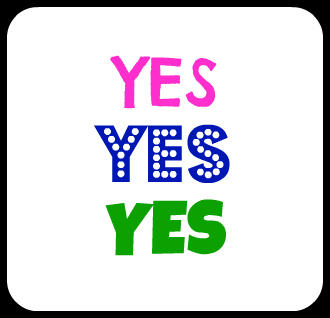 When are you going to plan your "Yes" day? This is great! I try not to say no too much, unless it's something absolutely ridiculous. good advice! this is just what I needed to hear! I know that I need to let more things go. This reminded me of the children's book "Yes Day!." My girls love that book and always ask for a yes day when they read it. I have tried to do this all along, but appreciate the reminder. Before I had kids it occurred to me that I got told "no" a lot for no real reason, and I vowed not to do that. What a fun idea! I've actually thought about this before. Mostly I say no because it's too much work or I'm busy at the moment they ask (a lot of times my answer is yes...just not right now). I'm working on that. I'll try a yes day! But my kids often ask for candy for breakfast, so I can't do that EVERY day. Have you read the book "Yes Day!" This would make a good tie in with this kind of day! Yes! Oh dear. I've been making so many mistakes! Thanks again for the reminder! !